Still endangered in Maine, the species is recovering from devastating effects of DDT in the 1960s. The fastest-flying bird in the world, which was nearly wiped out by pesticides in the 1960s, is making a slow but steady comeback in Maine, say state biologists, researchers and naturalists. A live webcam feed set up by the Biodiversity Research Institute in Gorham shows a nesting pair of peregrine falcons — one of no more than 25 pairs statewide — that have returned to an undisclosed site in southern coastal Maine. The female, the larger of the pair, has laid about three eggs so far. The birds can be seen at www.briloon.org/peregrinecam. Over the full nesting season, the institute anticipates at least 5,000 people will log on to watch the birds. Peregrine falcons, powerful raptors that can fly at 80 mph for miles and dive from midair at 200 mph, are nesting in three known sites along the Maine coast, between the New Hampshire border and Falmouth, said Patrick Keenan, outreach and education director for the Biodiversity Research Institute. With the institute’s webcam, birdwatchers can keep an eye on the one pair, which Keenan said have been documented nesting at that site since 2007. The eggs are expected to hatch around mid-May. The pair’s return to the site, where a dozen chicks hatched from 2009 to 2012, is a striking reversal from the 1960s, when peregrines, along with bald eagles, were nearly extirpated by the agricultural insecticide dichlorodiphenyltrichloroethane — DDT — which was widely used from the 1940s to the 1960s. In 1962, only one pair of peregrine falcons, documented at Acadia National Park in Bar Harbor, remained on the entire East Coast, Keenan said. “The peregrine falcon is the keystone species for understanding DDT impacts in birds, and they were … devastated by (it),” he said. 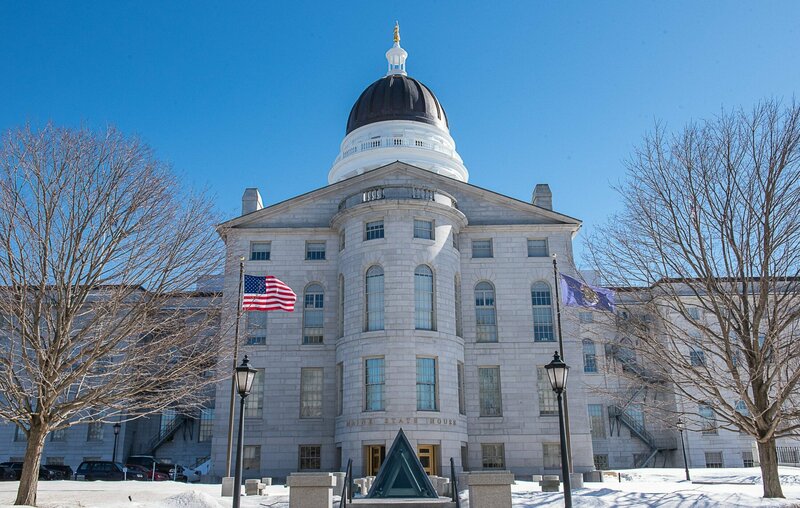 The birds were largely missing in Maine for 25 years, until a nesting in 1987, said Charlie Todd, coordinator for endangered and threatened species with the Maine Department of Inland Fisheries and Wildlife in Bangor. From the 1970s to the late 1990s, programs aimed at restoring falcon populations were established along the Atlantic Seaboard. In Maine, 144 “sub-species falcons” — birds from interior Canada and the Arctic — were released from 1984 to 1997, Keenan said. In addition to the pair being filmed on the webcam, other pairs of peregrine falcons have been found in recent years, in Acadia National Park and the higher elevations of western Maine, said Todd. The birds’ preferred habitat is mountains and coastal highlands, he said, but they have adapted to urban areas that offer similar conditions for a scrape — their nest. “It’s not a cave exactly, but kind of like an alcove,” said Todd. Falcons return to the same nest sites each year or maintain a presence in a territory year-round, Keenan said. The webcam, which runs continuously, is a partnership between the Biodiversity Research Institute, the Department of Inland Fisheries and Wildlife, the state Department of Transportation and the U.S. Fish and Wildlife Service. The exact location of the nesting birds is not being disclosed, Keenan said, to minimize the chance that they will be disturbed by humans while they’re still laying eggs. Institute officials plan to visit the site and band the young when they hatch in May. 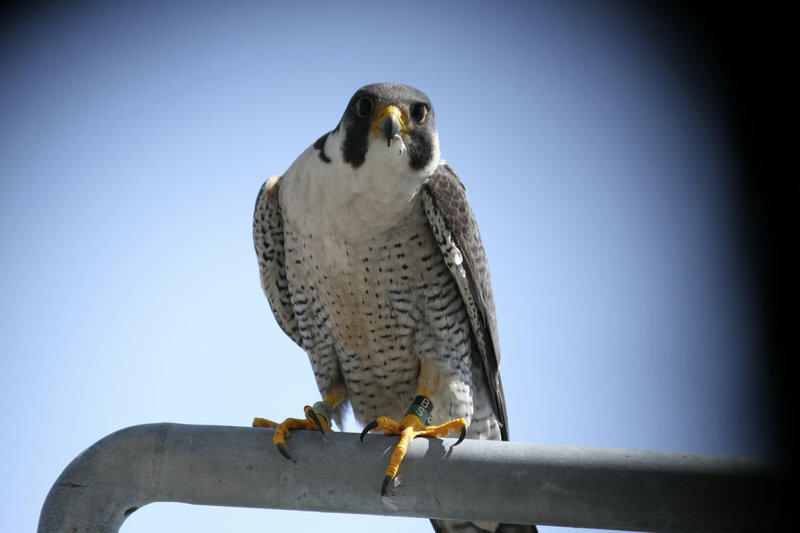 In past years, peregrine falcons have been sighted under the Casco Bay Bridge, said Mike Windsor of Maine Audubon in Falmouth. Typically, nesting falcons look for a small overhang. They don’t make nests as many birds do, but instead lay on hard surfaces that provide a degree of protection from above. Occasionally, pairs have needed human help with nesting sites, Keenan said. In one instance, biologists positioned a gravel-filled tray to lift a nest off bare concrete so the eggs wouldn’t get wet. The peregrine falcon is a smallish raptor, with a weight that tops out at 2 pounds. It stands about 18 inches tall and its wing span is 3 to 4 feet, Keenan said. This is the fifth year of the Biodiversity Research Institute’s peregrine-nesting webcam, which is helping researchers learn about the early stages of the birds’ lives, how long they live, their hunting techniques and aerial skills, their local movements and productivity, and their survival success. “For falcons, mortality is very high as they’re learning to fly and hunt for food,” Keenan said. Biologists band the young whenever possible, to track range and migration patterns, as well as survival and dispersal. “They have very extensive migrations,” Keenan said, noting that some peregrines may migrate from Maine as far south as the southern parts of South America — nearly 6,000 miles. The efforts being made on behalf of many bird species, including peregrines, grew out of investigations into environmental problems associated with DDT and other agricultural pesticides in the second half of the 20th century. The issues were brought to public attention in 1962 by biologist and writer Rachel Carson in her classic book, “Silent Spring,” which spurred intense controversy and concern about the pervasive use of agricultural pesticides, about which little was known at the time. The effects of DDT, among other pesticides, were a focus of environmental research for the next four decades. DDT was discovered to cause the deaths of many bird and animal populations, and, in subsequent generations, to lead to egg thinning and unsuccessful reproduction. The poison was banned for use in the U.S. in 1972, but because it breaks down so slowly, accumulating in the fatty tissue of many creatures, including humans, it is still routinely found in the environment. Though still endangered in Maine, the peregrine falcon has recovered enough in the western U.S. to be taken off the federal endangered species list, Todd said.